This photo tutorial on eye shadow for blue eyes brings color and technique together for fresh looks and new makeup tips for blue eyes. I love having blue eyes. You can use many different colors of eyeshadow and liner with them, and it almost always turns out well. Of course, brown eyes go wonderfully with bright and bold deep colors, while blue eyes require slightly less dramatic makeup to offset their vibrant hue. But blue is a color that naturally flows with other colors symbiotically - likely why jeans are colored blue and will naturally blend with any colored shirt you put on! It can be easy to run out of new ideas of makeup for blue eyes, but if you have, this photo tutorial should put a few back in your memory bank. 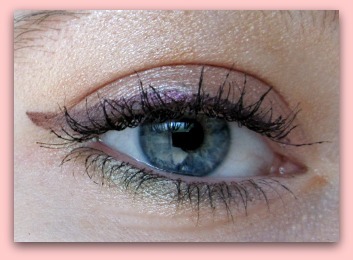 This look mixes a combination of purple, olive green, and pale gold to offset the eyes. It is a really pretty look that is great during the fall and winter months when it is darker and you might need a little color to wake up your eyes. I used a pale gold loose mineral powder to highlight, Wet N Wild pressed bronzer, L’Oreal’s Golden Sage Infallible pressed shimmer powder, Prestige purple liquid eyeliner, and my favorite Revlon Grow Luscious mascara in Blackened Brown. The first step is to highlight just below your eyebrows and under your lower lash line using the pale gold mineral powder. 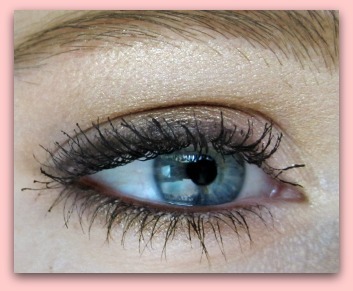 This will lighten your skin and draw more attention to the colors you put around your eyes. Take a few sweeps of medium bronzer and dab it onto the center of your eyelids, blending outwards. This will deepen the gold color on your eyes and in turn bring out the true blue in your eyes color. Using an eyeshadow brush or Q-tip, sweep the green below your lower lashes from the outside corner almost to the inner corner, stopping short at your last eyelash. 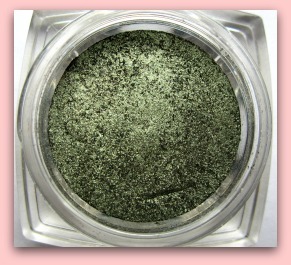 This shimmery green also brings out the sea colors in your eyes, especially in contrast to the gold. The last step is to apply your purple liquid liner from corner to corner. Try to stay as close to your lash line as you can, making the line a bit thicker towards the end. I like to flick mine out to create a small wing, giving my eyes a slightly more almond shape. This next eye shadow technique is my daytime version of the smokey eye. It uses a less deep color in the crease and fading out from the eye to be a true smokey eye. Instead, it uses a warm chocolate brown eyeliner to bring out the blue while still being daytime appropriate. To create this look, I started with the same highlighting technique as in the first photo. I highlighted under my brow and under my lower lash line with pale gold shimmer powder. This first step works great for just about any eye shadow for blue eyes because it adds color to your iris and brings definition to the brow at the same time. The second step was to use a darker gold in the center of my eyelid, blending it outwards for depth of color. Coupled with the chocolate brown, these shades bring out the blue in your eyes and really make them shine! Lastly, I used the brown eyeliner pencil to line my upper and lower lashes, making a thicker line on top. You can also connect the two lines at your inner corner if you choose. I prefer not to, as I love the wide open look you get when the lines don’t meet. Sweep on some mascara, curl your lashes if necessary, and this look is done! Return to Makeup Tips Home from "Eye Shadow for Blue Eyes"